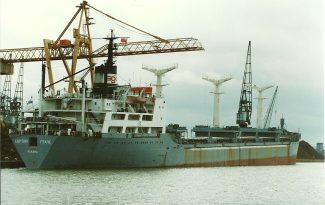 The bulkcarrier CAPTAIN FRANK in Tilbury on 8/4/87. Berthed on the scrap metal berth. RWJ ? Jack took this photo of the bulk carrier CAPTAIN FRANK on its one and only visit to Tilbury. It started life in 1970 under the name BULKNES, owned by an Anglo-Norwegian company and over time it had several owners and names. 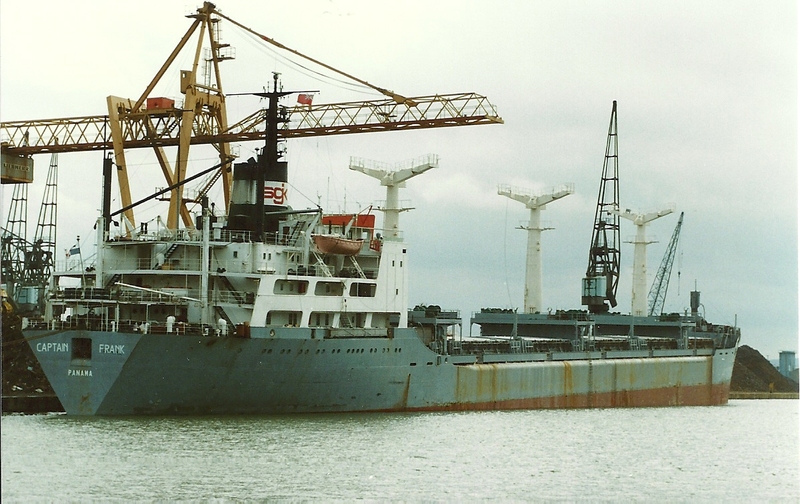 For fifteen months during 1987-88 it was named CAPTAIN FRANK, owned by Metropolitana Oriental of Panama and controlled by a firm based in Cagliari, Italy. It eventually went to a Chinese company and was renamed ZHONG HAI. I have an unconfirmed report that the it was broken up in China in 2002.